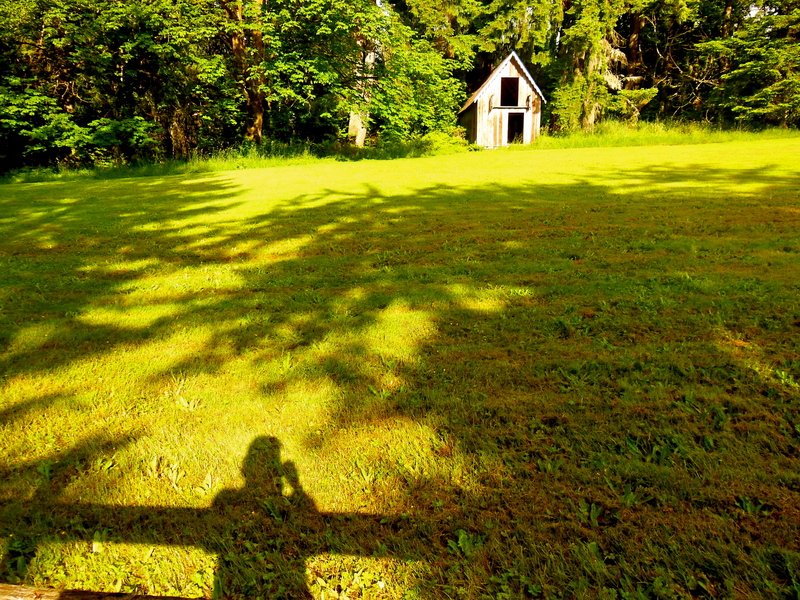 When I posted a Wordless Wednesday photograph on Facebook this week that I called “Shadowland,” the only shadows I saw in the picture were of myself leaning on the rail fence taking a picture of the tree shadows on the field in front of the weathered barn. Then my friends weighed in, reaching into the shadows progressively farther back in our collective memories. Charly who has been here only once—last summer for Emma and Wynne’s wedding—asked, “Do you see my shadow?” The shadowy images of Emma and Wynne and their wedding party standing in the doorways for their photo shoot, the field holding the parked cars of guests, flashed behind my closed eyelids. OBF (old boyfriend) Marc wrote, “I remember that barn well!” Oh. Right. Sweet sixteen, but not seventeen. And then the memories begin dancing across the meadows of my mind like dandelion seeds on a summer breeze, catching the sun’s rays then disappearing again into the shadowy past. There is our fat pinto mare, Scout, grazing on one side of the pasture, the steel wire fence bisecting her dining room from the growing grass punctuated with daisies—that I picked for our dining room table—where she will be moved when she has devoured the other side. And if I look squint-eyed I can still see the white scrolled railing on the hay loft balcony of her barn, before it rotted and fell off in the years since my dad died leaving such incidental things unrepaired. Pitchfork in hand, I am mucking out Scout’s stall and putting down fresh straw while Rebecca’s (back when she was Becky) pinto-colored guinea pig, Piggo 1 or Piggo 2, scratches in its cage in the other stall. Barbara and her family moved away in junior high, taking her horse Shadow with them, leaving me and Scout without our companions. My sisters and I left home one by one, and the pasture reverted to a daisy-filled meadow after Scout was given to a farm. Daddy never liked the daisies that Mama and I loved, and began mowing. The meadow became a field. They planted a vegetable garden in one corner, while the other end grew a Douglas fir forest. There is my little family with three-year-old Nicholas standing on the fence in the snow for a photo-op that was our Christmas card picture that year. Five years later, I see Daddy and three-year-old Emma in a pink hoodie holding an acorn squash, harvested from the garden. Mama and her four grandchildren scour the edge of the woods for wild blackberries with tin can buckets to hold the bounty for pie-making. Probably the same wire-handled berry pails that in an earlier time held wild Mt. St. Helen’s huckleberries. I wasn’t here when sixteen-year-old Nicholas and Daddy rebuilt the rotting lichen-encrusted fence in 1995, two days before Daddy died of a heart attack leaving it to be finished by relatives here for a funeral; but the image is there in the sorrowful shadows of my mind anyway. Shadow meets shadow as Nicholas and Kristy, with three-year-old Max standing on the now lichen-encrusted fence his Daddy helped build, pose for a photo on a sunny summer day. Friends are the sunlight that cast the shadows of our memories onto the ground where we can see them. I am grateful for mine. Funny, one usually thinks of the writer dwelling in memories, friends listening out of friendship or love or kindness or all the above. It isn’t a seemingly run of the mill turn of events for friends to set a match to the kindling of memory. I’m glad to be of their number. Gretchen , reading your stories of the field and fence bring them to life. Amazing how the the recalling of a memory clears the dust from them. I enjoyed your memories very much.